If an employee doesn’t get “enough” work done, then there are only three logical possibilities: that employee needs to work either more, faster, or both. Simple, right? Just keep that employee in their chair and keep a fire lit under it. But it’s rarely quite so simple. 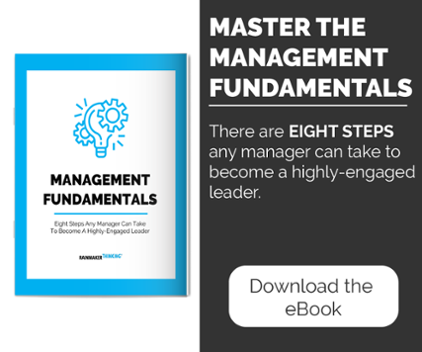 Here’s what usually happens: Assuming you have already embraced the management fundamentals and have metrics in place, the manager shows the employee the numbers and says, “Your number is short of your goal.” And the employee says, “Yes, I know. I’m trying.” Until the next week, when they have the same conversation again. Metrics are great. But they are only step one in performance management. Staring at the numbers together would be like a sports coach running down the field alongside an athlete, saying, “Run faster, run faster!” The athlete is already trying to run faster! What they need to know from the coach is how to run faster, in the form of good course-correcting feedback. You, the manager, are the performance coach. The metrics are valuable only if you use them every step of the way to develop informed and specific course-correcting feedback for your direct reports. You need to be able to coach your employees on how to increase productivity. Faster is not always better. Imagine two employees who are doing the same basic task, but one is doing it twice as fast as the other. I always joke: either the slow one is playing a lot of solitaire or the fast one is sloppy or cutting corners. Sometimes it turns out that employees who work at a faster pace make a lot more errors than those working more slowly. Productivity and quality are in constant tension with each other. When employees are careful to dot every i and cross every t, and then double-check and triple-check, it usually slows down production. When employees speed up, quality often suffers, at least to some degree. The real question is whether or not the increased productivity is worth more than the loss in quality. The good news is that an employee who is that committed to quality is likely to be an engaged learner and open to performance coaching. Tune in to this quality-focused employee’s careful, deliberate style. Take a very deliberate approach to helping them speed up. In your regular one-on-ones, focus on the goal of starting to speed up, slowly but surely. Watch the employee perform the task a few times. Break each task down into its component steps, and break each step into a series of concrete actions. Then time the whole thing. Figure out: how long should each step take? Step by step, action by action. Create a time budget for each task. Do a micro-gap analysis. Identify the micro-gaps between the time budget and the employee’s actual time, step by step. In these micro-gaps lie the greatest potential opportunities to speed up. Choose one concrete action at a time to accelerate, and take it slowly. What if the employee could speed up just one concrete action per week? Close the micro-gaps one by one. By going one action at a time, you will minimize the chances of increased mistakes in the effort to speed up. Once you’ve increased the speed of one task, move on to the next. Every step of the way, remember to monitor the quality of this person’s work to make sure it doesn’t dip, and acknowledge the continued high quality as pace speeds up, slowly but surely. Is the employee doing it wrong? Look at the employee’s every action in the process and check it against best practices. Start coaching to fill any gaps. Is the employee doing unnecessary tasks as part of their process? Start coaching the employee to stop doing these unnecessary tasks, regardless of what itch they may scratch for them. Is the employee building unnecessary steps into any tasks, or creating any detours? If so, streamline the process, then start coaching others on how to adopt the streamlined process. Is the employee encountering any obstacles that have not been taken into account? If so, can the obstacles be removed? Or can a ready-made solution be provided to deal with the obstacles when they occur? Start coaching on using those ready-made solutions when the obstacles come up. When you take the time to study exactly how an employee is doing a task, responsibility, or project, you may find that increasing productivity isn’t worth pursuing. You may discover that carefully following best practices takes longer than you originally thought. You may find that the employee’s more time-consuming approach is worth so much more in quality that everyone should adopt it. In any case, you will probably identify some very specific opportunities to help this employee improve, even if they aren’t related to productivity. In your regular one-on-ones, start working on these specific goals, one task at a time, step by step.